James Connolly—prior to his ‘kidnapping’ on 19 January 1916 he suspected the IRB Military Council as ‘would-be Wolfe Tones—legally seditious and peacefully revolutionary’. (This was published the day after Connolly’s return from his ‘kidnapping’ but was undoubtedly written before it.) His writings in the Worker’s Republic intensified the lack of understanding between the Volunteers and the Irish Citizen Army (ICA). Though his articles became more impassioned, it is unclear whether Connolly was really prepared to fight the British without the other nationalist organisations, or how far he was trying to provoke the authorities into attacking the ICA and ITGWU. In any event, Connolly met with the Military Council of the IRB on 19 January 1916, and they stayed in a brickworks in Dolphin’s Barn until 22 January. An agreement was reached between the ICA and the Military Council to work together towards a rising at Easter. 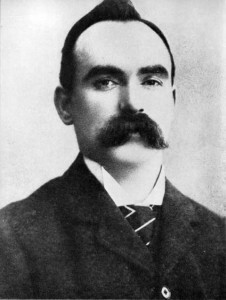 Connolly agreed to abandon his openly declared intention to strike independently. Prior to this, the Military Council regarded Connolly with suspicion for endangering its plan, and he suspected them as ‘would-be Wolfe Tones—legally seditious and peacefully revolutionary’. Some earlier writers opined that Connolly was ‘kidnapped’ on 19 January 1916 and ‘held’ until 22 January. Most, however, now agree that he met with the Council voluntarily. In September 1914 Connolly had attended a meeting at 25 Rutland Square with senior IRB officials at which the prospect of a rising was discussed. 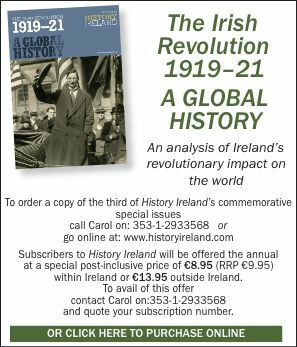 Connolly was enthusiastic, convinced that an Irish revolution would have to be a two-stage process in which the struggle to overthrow capitalism would have to be preceded by a rebellion to gain independence. Later, Pearse and Eoin MacNeill met with Connolly in early January 1916 in an unsuccessful attempt to restrain him from any premature action. It is believed that after this meeting Pearse reported to the Military Council that Connolly should be brought into their confidence about the date for which a rising was planned. There has always been speculation about Connolly’s disappearance. The latest theories seem to agree only that Connolly spent those three days in secret consultation, probably with Pearse, Clarke and Plunkett, and that he did so either on his own initiative or at their invitation, without any question of coercion or detention being involved. In any event, from February 1916 onward, the ‘war parties’ in the ICA, IRB and Volunteers formed a united block. Joseph E.A. Connell Jr is the author of Who’s who in the Dublin Rising 1916 (Wordwell Books). É. Dore, BMH witness statement 392. M. Ó Dubghaill, Insurrection fires at Eastertide (Cork, 1966). D. Ryan, The Rising: the complete story of Easter Week (Dublin, 1949).